Surrounded by the blue mist of the Great Smoky Mountains, the community of Pigeon Forge, Tennessee is filled with rivers and streams, waterfalls and native flowering plants and trees. 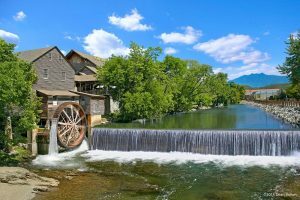 Pigeon Forge is packed with southern hospitality and as many as 11 million tourists visit each year making the town not only one of the fastest growing tourist destinations in the southern states, but a charming real estate market with a strong economy. Located along Highway 441 only five miles from Gatlinburg, Pigeon Forge is an action-packed town nestled in the breathtaking setting of eastern Tennessee. It is a wonderful place to call home, or to invest in a home away from home. Some of the more popular attractions in Pigeon Forge are the Dollywood Theme park and water park, golf courses with rolling hills, tubing, hiking, backpacking, camping, horseback riding, and hot air balloon rides over the misty blue mountains. Follow any of these activities with dinner at one of many diverse restaurants offering cuisines to inspire all tastes. Ultimately, the greatest appeal of Pigeon Forge is the natural surroundings that boast four distinct and mild seasons to satisfy the lifestyles of all residents and visitors alike. If the never-ending recreational opportunities of this outdoor mecca do not inspire homebuyers, perhaps they will be by the distinction given by Southern Living Magazine Readers Choice Award in 1996 as being the shopping paradise of the south, with unlimited outlet malls and retail shops, surrounded by a thriving real estate market. One of the earliest settlers to the Little Pigeon River in the Sevier County region was a man named Richard Fanshiers, and the town held his name, Fanshiers, until the early 1800s. Along the beautiful river that flowed through the land grew beech trees, and the beech nuts feed the now extinct species of Passenger Pigeons that flocked to the river. In 1820, Isaac Love built an iron forge along the river, and in 1841 a post office was established under the name of Pigeon Forge. In 1885, a mill was built in the location and is still in operation today, using the same machinery. The mill is a National Historic Landmark and a proud part of the history of Pigeon Forge. In 1946, changing the face of history, an old tobacco barn was sold and became Pigeon Forge Pottery, which is still in existence today. This sale officially marked the first tourism-related business in the region and the beginning of what would transform cornfields into tourist attractions to create the backbone of the local economy. This once sleepy mountain community is now a bustling real estate market in Pigeon Forge offering single family homes, cozy or resort style log cabin homes with stunning mountain vistas, gated communities, condos and townhomes, golf course homes and large estate homes. Sevier County is proud of its low crime rate, low tax rate, exceptional educational systems and healthcare, along with a booming work environment. The small town atmosphere of Pigeon Forge, filled with genuine southern charm and hospitality, is one of the other many reasons to call this community home. Homes for sale in Pigeon Forge, Tennessee are reasonably priced and exceptional in value. Buyers looking to relocate or invest in a second home, will find the real estate market in Pigeon Forge to be varied in styles and amenities, offering mountain charm and modern conveniences, surrounded by the tranquility and hanging blue mist of the Great Smoky Mountains. Have you ever wanted to be on the top of the world? That is what it feels like when you reach the summit of Bluff Mountain, Tennessee, at an elevation of about 3,000 feet. The views truly do take your breath away and take you to a place where the chaos of the modern world does not exist. The serenity of Bluff Mountain, in Sevier County, is highlighted by the natural beauty and mild, yet distinctive, four seasons offering unlimited recreational opportunities. There are activities in the region to keep even the most active outdoor enthusiast busy including hiking, hunting, mountain biking, whitewater rafting, golfing, fishing, boating, camping, skiing and more. Or, if shopping and enjoying a variety of cuisine is more appealing, the options are endless. Bluff Mountain Adventures offers the opportunity to experience this region by all-terrain vehicles on trails expanding over 7,000 acres while highlighting the fantastic views offered by Bluff Mountain. Once you have experienced Bluff Mountain by ATV, chances are you will want to wake up every day with the peaks of Mt. LeConte, Cove, and English, as well as the rest of the Great Smoky Mountains landscape. Bluff Mountain is just minutes from the excitement of Sevierville, Pigeon Forge and Gatlinburg, but it feels like it is in a world all by itself. Bluff Mountain, Tennessee offers homebuyers quiet serenity with all the conveniences of the city only a short, breathtaking drive away. Just minutes from the hustle and bustle of downtown Pigeon Forge is “God’s Country” or at least that is what the locals call Wears Valley, Tennessee. Located between Pigeon Forge and Townsend, Wears Valley is a peaceful and secluded setting surrounded by breathtaking mountains and within reach of the Great Smoky National Park by way of Metcalf Bottoms, its own entrance to the National Park and one of only five. Located along Highway 321 in the southwestern corner of Sevier County, Wears Valley is a prime location for investment properties, second homes for peaceful vacations, or single family homes for full-time residents. The low crime and tax rates of Sevier County, along with excellent public schools run by the Sevier County School District, are what make Wears Valley a fabulous location to own property. Wears Valley was first settled in the early 1700s, and today it still has fewer than 2,000 full-time residents. Religion is a vital part in the history of this mountain community, and as a testament to the residents’ past and present faith, Headrick’s Chapel is on the list of National Historic Buildings. Residents can enjoy the view of Mt. LeConte in the distance from their luxurious cabins high on the mountains or sprawling farms nestled in the valleys. 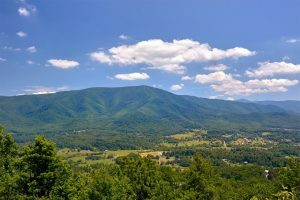 The actual size of Wears Valley is only six miles long and four miles wide with gaps at either end of the valley leading to neighboring towns. What used to be a little known valley with green meadows and cool mountain streams is fast becoming discovered due in part to its natural beauty and location within easy access to all the latest attractions and recreational opportunities offered in nearby Pigeon Forge, Gatlinburg and Sevierville. Wears Valley is also a showcase location for local artists and crafters in the region. The mild climate of all four seasons, the unlimited recreational opportunities and the easy access to major medical care, airports, shopping, dining, and basically anything you could need or want, make Wears Valley a great location to call home.